Saturday’s 5-1 exhibition win over the Boston Bruins marked the Red Wings’ opening of Little Caesars Arena. It may not count as anything in the record books but it was the first chance to see what a Red Wings’ hockey game at the new arena looked like. Parking around the arena is relatively awful in comparison to around the Joe. More specifically, traffic getting in and out is. The JLA parking structure was something of a nightmare but at least there were surface lots nearby that you could get out of and on your way quickly. At LCA, the surface streets were backed up all around the arena. I’m sure it didn’t help that a Tigers game was getting out at about the same time as the Wings were wrapping up, but the Wings game wasn’t exactly a sellout (no matter what they announced) so there’s some trade-off there. The arena felt quiet. Maybe that’s because it wasn’t packed. Maybe it’s because the game wasn’t great. Maybe it’s because I was tucked up in the last row of the upper bowl behind the gondola. Maybe it was loud but just felt quiet. Or maybe it really was quiet. I don’t know. That there were only one or two sustained “Lets Go Red Wings” chants could point to it just being a quiet night. Or the arena killing sound could be why chants didn’t pick up. The center ice sections of the lower bowl are now club seating so good luck getting down there if you’re someone who likes watching warmups. I’ve heard a lot of people raving about the food choices but as someone who doesn’t go to an arena to eat… Meh. The food is expensive, though. The “$5 for a bottle of water” kind of expensive. My seats were in the last row of the upper bowl and they were still pretty fantastic. I think I even managed to get some good player photos from where I was, which is better than I can say about Tampa or Columbus. There’s still a ton of construction going on around the arena. That’s going to be happening for awhile. Even with the arena itself done, we’re not seeing anything close to a finished product yet. Overall, it felt kind of like a road game. I think that’s to be expected and is a feeling that will go away with time. 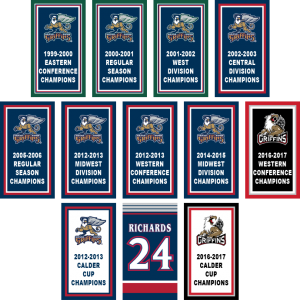 In just over two weeks, the Grand Rapids Griffins will raise another Calder Cup Championship banner to the rafters of Van Andel Arena. They’ll then probably move it to a spot on the service walkway on the south end of the stadium but that’s beside the point. I was at the Van for a concert last night and was looking at the existing banners, wondering what the new ones might look like. They’re the first ones with the new logo and colors that the team introduced for the 2015-16 season. If I had to guess, the Calder Cup Championship banner will be in the style of the current one, with the 2013 championship logo swapped out for the 2017 version. I’m less certain about the Western Conference Champion banner, though. A black version of the previous banner style? Will the logo still inexplicably be in an oval? Will the Calder Cup banners be grouped together or will everything remain chronological. The new banners follow the style I outlined four years ago, with coloring and striping based on the current jersey designs. And, just as was the case four years ago, I know the number font on Travis Richards’ retired jersey number isn’t quite right. While I would prefer to see these banners actually hanging from the rafters, I know the team doesn’t do that, so I imagine that first set on the east side of the service walkway, the second set on the west side, with the Calder Cup and retired number banners in the middle. You could do five on the east and four on the west but I think there’d be a weird kind of symmetry having one of the “wrong” banner style in each set. Of course, I don’t expect my idea to be used. We’ll just have to see what they actually do on October 6. I always have a hard time figuring out what to say on DetroitHockey.Net’s birthday. I have the tendency to pledge to do something in the coming year and then not actually do it. Two years ago I mentioned building a new DH.N store, which I’m just now finally getting around to. To be fair, last year I mentioned rebuilding the site’s multimedia section, which I did last month. Call it progress. So tonight marks 21 years since I started this site. I don’t have a whole lot to say about it but I think that’s worth commemorating anyway. Thanks for taking some time out of your day to celebrate with us. Having had two hours to wander around the Red Wings’ new home earlier today, I’ve finally gotten an opportunity to put together some actual thoughts on Little Caesars Arena. A new arena won’t save the Red Wings from the issues they face on the ice and the ticket prices at said new arena won’t win them any favors with the fanbase, either. I’m not excited about this season and Little Caesars Arena doesn’t change that. That said, it’s pretty easy to be excited about the venue itself. I came in through the southwest entrance and the first thing I noticed is the ridiculous amount of natural light in the much-promoted Via concourse. I’m curious how that space will look at night but in the day it’s unlike any NHL arena I’ve been in. The concourse doesn’t feel like an arena. It feels more like a mall. A large, open hallway with shops and food vendors on either side. Maybe during an actual event the “portals” leading to the arena bowl itself would be more prominent but during the tour that wasn’t the case. The portals are significantly more prominent on the upper concourse, which is more sparsely-populated in general. The Production Line statues from Joe Louis Arena have made their way to Little Caesars Arena but are no longer grouped together. I don’t love that but each statue now has a photo of the player with his jersey number as a backdrop, which does look really good. The Via concourse includes custom manhole covers honoring people important to Red Wings and Pistons history. It’s a nice feature but not one that really impacts anything. My favorite feature is probably the “Olympia” signage from Olympia Stadium having been re-mounted in the east concourse, right next to a giant mural of Gordie Howe. In the arena bowl itself, the scoreboard is probably the biggest change. It’s just huge. I’m not sure if it’ll be overpowering or not but that’s my concern. I would have loved to see the arena bowl lit up like it would be during a game. The lower bowl feels pretty standard. It’s clean. There are cupholders. I’m not sure that’s going to feel very different. The upper bowl is going to take some getting used to. Accessing it from its own concourse should make traffic in the arena much more tolerable. The upper bowl is steep. There are actually handrails and I imagine they’ll get some use. There are no bad seats in the arena. The last row of the upper bowl has a great view. The gondolas block the scoreboard but not the ice. The gondolas have a great view as well. You really do feel on top of the ice. The thing that struck me most after the fact is that I was looking at the concourse and saying “This reminds me of Nationwide Arena.” and I was looking at the seating thinking “This is better than Amalie Arena.” At no point did I compare it to Joe Louis Arena. In all honesty, there really is no comparison. As I noted on Twitter, “Mr. I” appears behind the nets on both the main sheet and the practice rink, so I wonder if that will be a permanent tribute. Speaking of the practice rink, the team’s Stanley Cup banners from the Joe are hung there. There are new banners hanging over the ice at Little Caesars Arena, in some kind of box that makes them retractable for different events. They were retracted during today’s tour. I overheard someone say that the Red Wings’ banners would be retracted for Pistons’ games and vice-versa but that seems a bit weird to me given their placement in the arena. The Red Wings’ banners are all on one side and the Pistons’ are on the other. If only one set was going to be displayed at a time, why not spread them out over the entire arena? I don’t like the placement of the banners in general, but that’s a rant for another time. Unless I missed it, Larry Aurie does not have a commemorative manhole cover. That’s the least the team could have done if they’re not going to give him a banner in the rafters. Also, while the Via concourse is pretty incredible, the north and west sides of the arena are a bit more standard. Nonetheless, I look forward to seeing a game played there to see how some of this works out in actual use.